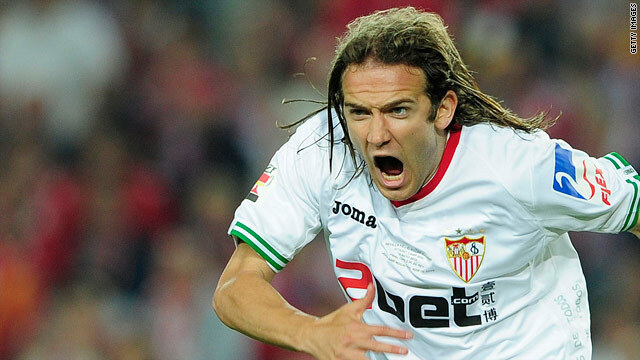 Diego Capel wheels away in celebration after scoring Sevilla's opening goal against Atletico Madrid. (CNN) -- Sevilla have won the Spanish Copa del Rey for the second time in four years, and fifth time in their history, after beating Atletico Madrid 2-0 in the Nou Camp final on Wednesday. A superb early strike from Diego Capel set Sevilla on their way and a late breakaway goal from Jesus Navas secured victory and prevented Atletico from adding to their Europa Liga triumph over Fulham last week. The Andalucians -- who beat Getafe 1-0 in the final in 2007 -- got off to a perfect start when they went ahead in just the fifth minute. A Navas shot from the right was blocked by the Atletico defense, but the ball fell superbly to Capel on the edge of the area, who let fly with a powerful left-foot strike that gave goalkeeper David De Gea no chance. Atletico poured forward looking for an equalizer and top scorer Diego Forlan was denied on more than one occasion -- notably when Sevilla goalkeeper Andres Palop made a superb save in the 79th minute. But their constant attacking left gaps at the back and in the final minute Sevilla broke clear, leaving Navas time and space to round De Gea before firing the ball home, sending the Sevilla fans -- who were out-numbered by the Atletico supporters -- into raptures. The result completes a memorable four days for Sevilla, who have added the cup to their success in snatching fourth position in La Liga on Sunday -- and a place in next season's Champions League.